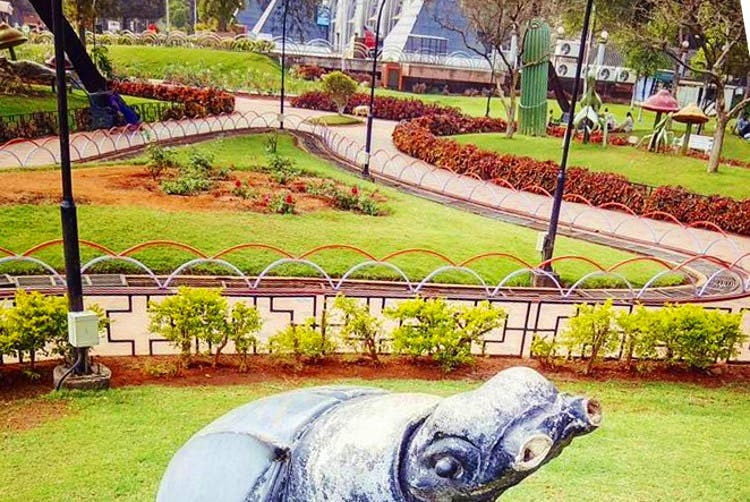 NTR Gardens, adjacent to Hussain Sagar offers a serene atmosphere, a wide range of recreational activities and an experience unlike any other park in the city. NTR Gardens is a memorial of late Shri N T Rama Rao, the veteran actor and former Chief Minister of Andhra Pradesh. It is also a theme park. Enter beautiful fountains, horticulture that will astonish you, and a series of cascades. The park is built with a balance between serene natural beauty and lots of entertainment options. Walk beyond the ticket counters and get into Pearl City Express, a toy train which is also a major kiddie attraction. They also have mist fountains, bonsai exhibition, a play area and rides. It’s no less than a fair every evening with people flocking to get on the Columbus ride, the giant wheel or on a high rise towering merry go round that gives you a mesmerizing view of the city. Children smiling from carousels, playing dashing cars and jumping in bouncy castles is an admirable sight at this park. NTR gardens also has a bungee jumping area, a trampoline and ball pool. Something for kids of all ages, don’t you think? They have multiple walkways that are finely decorated with arches and plants. You can also find an installation of insects statues that consist of grasshopper, beetle, and butterfly which are again an attraction for kids and can be used to educate them. The park has a massive structure of a fruit bowl that you can go in and out of, and a Machan Tree that’s our favourite here. This stunning tree can be climbed upon and you can slide down again through a water slide. It’s the most fun thing to do at NTR garden, so much so that we’ve done it thrice (guilty pleasure). The turn in this water slide is so unpredictable each time, and it really is tempting! Although visitors are not allowed to carry any eatables inside the park, they do have car-cafes with plenty of options and seating for six, stalls that sell mirchi bajji, and cotton-candy and an ice-cream parlour too. If you’re looking to get something quirky out of a visit to this park – hit up one of the caricature or sketch artists who often spend their evenings making beautiful pencil images of people. You can walk around, or spend some time on the lush green lawns observing the plethora of activity that is happening all around you, or if you want some more peaceful time – you could even get on a boat ride here.